Before I begin, I want to mention that when I say, “Why I love chickens,” and not “Why I love chicken,” we know we are talking about living chickens, right? The “s” is so critical. Just try sitting down in a restaurant and saying, “Boy, I’d love some chickens right now.” Sounds so wrong. Right? I no longer order chicken, or chickens, in restaurants. 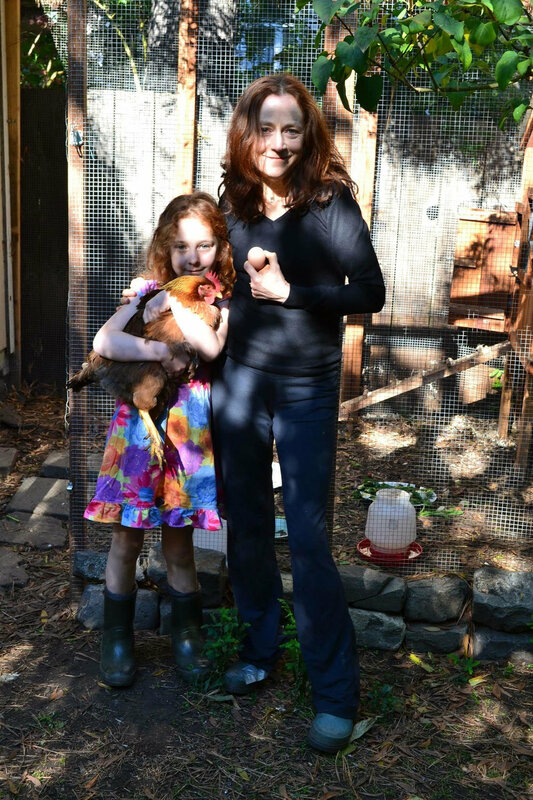 Six years ago I became one of those city farmers who name their chickens after I brought home a flock to live in my San Francisco backyard. They enjoy a pretty nice life sitting in the sun, destroying my lawn, taking dust baths, laying eggs, chatting with each other, and hunting for bugs. Sometimes I like to sit in my yard and watch the chickens being chickens, a refreshing change from watching people being people. As the years have passed with chickens (not chicken) in my life, I wish I could say I truly understand these great-great-great-grandchildren of dinosaurs. They can be strange creatures, with their swiveling eyes and herky-jerky steps. But as the mystery of being a chicken grows larger for me, so does my admiration for them. Their many unique qualities daily wake me from the ho-humness of regular life. Here’s a short list of why chickens make me so happy. Leslie with Alice, who “has more going on upstairs” than her other chickens. They’re funny. Watch a chicken run and it’s as laugh-out-loud funny as watching John Cleese do a silly walk. Want more funny chicken stuff that can go head-to-head with any cute cat video? Here you go. Please share if you’d like. Cat videos are so 2015. They’re smart. This can be a hard case to make because, of course, chickens are not rocket scientists. And yes, okay, okay, they have small brains. But whatever neurons are firing in those bird brains allows them to do math, like add and subtract, and recognize shapes. They have really good memories. They can remember up to 100 other chickens along with the people they like, and don’t like, even after spending many months apart. They can also be taught to play the piano (here’s one playing, “America the Beautiful”) and ride bikes, which I love so much that I gave Gwen, the heroine of my children’s book about a chicken, her own bike. With sparkly tassels, because a chicken would like that. Leslie Crawford’s love for chickens is part of what led her to write, Gwen the Rescue Hen, which is on sale now. I have observed that, as with people, some chickens have more going on upstairs than others. My favorite chicken Alice somehow always figures out how to get to the good food no matter how many fences and blockades I construct. She also regularly uses her eggs to get what she wants. Recently she walked past me while I was working, disappeared for an hour, and then popped up again, retracing her path to the yard. Later, we found one of her usual stunning green eggs, right in the middle on my daughter’s bed. I concluded it was Alice’s way of thanking my daughter for all the treats she gives her and, in a more Machiavellian maneuver, eliciting an onslaught of more hen goodies. She is also quite wily, hiding her eggs all over the garden instead of in the nesting box. I will never know for sure, but I suspect she’s trying to keep her treasures out of my greedy hands. A skeptic might posit that these behaviors signal she’s more of an odd bird than an intelligent one. I’m happy to concede to both. Alice is an eccentric, clever chicken. Anybody who has met her is dazzled by her winning and curious nature. Egg on a bed. A still life by Alice the chicken. Chickens have remarkable eyesight. You can’t even begin to imagine what chickens see, unless you’ve dropped acid and had a good trip. Then you may have some sense of what they see all the time: the entire world in pulsating, vibrant technicolor. In more technical terms, this means that while people have trichromatic vision and see three colors (red, blue, and green), chickens have tetrachromatic vision, which means they’re sensitive to four wavelengths that include red, blue, green, and ultraviolet light. That extra special wavelength makes the world really trippy. If you saw the world through a chicken’s eyes, you’d also be able to detect the smallest object, like a pill bug waiting to be plucked from the moist brown earth, which makes a delicious chicken snack. Some more freakish features: Each eye can move independently, which accounts for why chickens can look a little...off. They also have three eyelids and a 300-degree field of vision without even moving their head. This allows them to see in advance what could potentially swoop down on them, giving them plenty of time to run. They sing after laying an egg. Wouldn’t you? Their language also includes up to 30 trills, peeps, clucks, cackles, squawks, growls, and calls that communicate affection, contentment, anger, fear, danger, lustiness and more. They’re omnivores. My chickens’ favorite things to eat are dried mealworms, spaghetti, grapes (cut in half, please), corn on the cob, and yogurt. By the way, watching a chicken eat yogurt is almost as funny as seeing a chicken run. They can cuddle and purr. It takes time to earn a chicken’s trust, and not all of my chickens like being held or petted. My chicken Fullerton never will abide my overtures. She’s a standoffish bird. But if you sit near chickens and let them get used to you, they tend to enjoy sitting on your lap and being scratched behind their ears and neck. The cuddliest of them will purr, too. Chickens won’t do much to improve the way your yard looks, but they do make life more interesting. Their earlobes can signal the color of the eggs they’ll lay. It’s true! But first, if you’re picturing a chicken with Alfred E. Newman ears, well, that’s funny, but chickens earlobes are flat against their head and very small. Often, tan earlobes indicate they’ll lay tan-shelled eggs. White earlobes, white. There are exceptions: hens with red earlobes usually lay eggs in shades of brown. The Silkie, a weird, very small, and wonderful breed, has blue earlobes and lays light brown or almost white eggs. So earlobes are a somewhat imperfect guide to egg color. They have a great sense of timing. Breakfast is a chicken’s most important meal of the day. If I’m late with their feed and mealworms they’ll cluck at me, annoyed, and pace in circles. My chicken Summer, the leader of the brood, will peck at me, gently. Except for the time she really nipped me. I’m not late with breakfast anymore. Chickens are emotional and empathetic. My chickens exhibit the full range of what we think of as human emotions. Given that so many animals experience a broad range of emotions we should really stop using the expression “human emotions.” They are joyful in moments they’re let out of the run and scamper into their favorite spot in the sun. They are fearful. It is heartbreaking hearing them squawk and search for cover when my son’s dog tears after them. They can be fiercely protective. Summer, my head girl, is a firm mother hen who herds her girls into the run every night to keep them safe from predators. They are upset when another chicken is sad, and share in each other’s happiness, too. When one hen starts singing after laying her egg the other chickens often join in. When people tell me chickens don’t have feelings or are “bird-brained,” I like to remind them that, as with any animal, chickens possess qualities that may not be human-like but in no way makes them lesser. Just different. (And you try spotting a pill bug several yards away to your left without turning your head!) Just because they aren’t human doesn’t mean they don’t want what all sentient beings want, the chance to live their lives the way they were meant to be. How is it that, now in middle-age, I am at the service of birds, and so many of them? There are, presently, eleven birds that receive full room service, twice a day, with clean bedding, fresh water, gourmet food (dried meal worms for the chickens, safflower seeds for the pigeons). On paper, or from the outside, it would be an understandable leap to think of me as a crazy bird lady. We like to make the ladies crazy, don’t we? Particularly if the ladies have cats or chickens or goats or ducks or dogs. I have found, among the crazy ladies I love so much - my sister-in-law Jeri, who has a farm outside of Assisi, Italy that is populated with dozens of ducks and chickens and very soon, may add donkeys and pigs; my friend Elissa, with her goats and chickens in Northampton, New Hampshire; my twelve-year-old daughter Molly, whose burning desire it was to have pigeons in our home in San Francisco; and me, whose burning desire it was to have chickens - that we desperately want to be close to these animals. So desperate that we are at the service of them, daily. For anyone who has an animal, their days begins and ends at the service of the creatures that have no choice but to depend on us. For me, my day begins and ends with the birds. If nothing else, if I haven’t accomplished anything else in my day - and because lately my days have fewer accomplishments, at least on paper, than it did even a couple of years ago - I have put on my work boots, stepped in a pile of it (there are piles of it everywhere when dealing with birds), and talked to the birds. Because that’s what the crazy ladies do.